This publication explores the success of major innovation and entrepreneurship clusters in OECD countries, the challenges they now face in sustaining their positions and the lessons for other places seeking to build successful clusters. What are the key factors for cluster success? What problems are emerging on the horizon? Which is the appropriate role of the public sector in supporting the expansion of clusters and overcoming the obstacles? The book addresses these and other issues, analysing seven internationally reputed clusters in depth: Grenoble in France, Vienna in Austria, Waterloo in Canada, Dunedin in New Zealand, Medicon Valley in Scandinavia, Oxfordshire in the United Kingdom, and Madison, Wisconsin, in the United States. For each cluster, it looks at the factors that have contributed to its growth, the impact of the cluster on local entrepreneurship performance, and the challenges faced for further expansion. It also puts forward a set of policy recommendations geared to the broader context of cluster development. 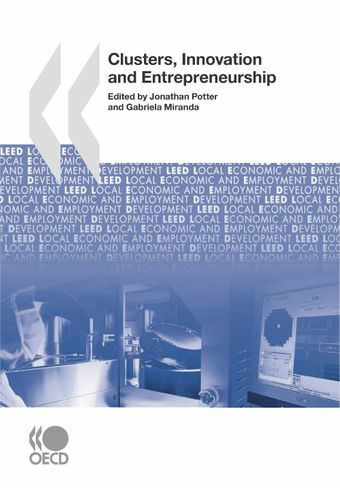 This publication is essential reading for policy makers, practitioners and academics wishing to obtain good practices in cluster development and guidance on how to enhance the economic impact of clusters.